Newburyport Brewing today announced cellar expansion plans to double the capacity of its production facility to 15,000 barrels, a figure that, when reached, will cement its position as a regional brewery in the Northeast. Assisted by a $280,000 export equipment loan that comes with a $196,000 export guarantee from MassDevelopment, a finance agency that works with Massachusetts businesses and nonprofits, the brewery is installing five 80-barrel fermenters and two 80-barrel brite tanks to meet increasing demand, according to company co-founder and COO, Bill Fisher. In 2014, the brewery’s second year in business, Newburyport produced 7,500 barrels of beer, heading against total capacity. It wrapped its first year topping 5,000 barrels. Looking ahead, Fisher told Brewbound that the company is anticipating growth of roughly 60 percent for a total barrel output of around 12,000 in year three with a stretch goal of 15,000. Newburyport has a 20-barrel brewhouse that would enable it to produce about 30,000 barrels “under maximum conditions,” said Fisher. The company expects to wrap the expansion early this month with ramped up production slated to be underway before the start of May. 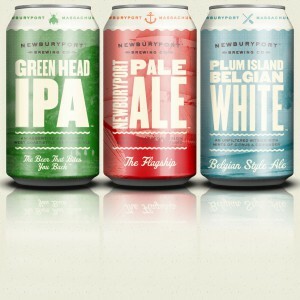 Newburyport beers are currently available in its home state of Massachusetts and New Hampshire. The brewery is also partnered with Delta Air Lines, which serves its Pale Ale on regional shuttle flights across the U.S. There are no immediate plans to expand its distribution footprint. The company currently staffs 12 full time employees, five of which were brought on in recent months in preparation of expanding, said Fisher. The company also has 10 part time employees.